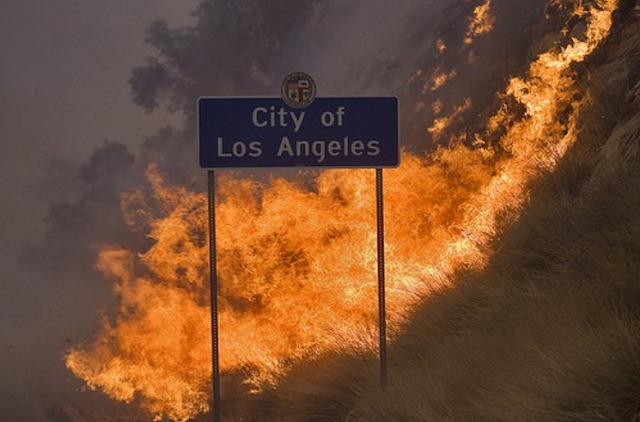 The Big Wobble: It's now a total of six massive wildfires raging out of control in southern California: 2017 record breaking year around the world! It's now a total of six massive wildfires raging out of control in southern California: 2017 record breaking year around the world! It's now a total of six massive wildfires raging out of control in southern California with the Lilac Fire the latest to ravage homes and causing thousands of evacuations. A new fast-moving wildfire tore across thousands of acres near Fallbrook Thursday, gutting dozens of homes while threatening hundreds of others, injuring several people closing roads and forcing widespread evacuations. The wind-driven blaze erupted for unknown reasons about 11:25 a.m. just west of Interstate 15 and north of Lilac Road in Pala Mesa amid gusty, arid weather. Within an hour, the burn area had grown to about 50 acres as ground and airborne crews laboured to keep the blaze, dubbed the Lilac Fire, from becoming a disastrously out-of-control conflagration like others raging this week across Southern California. By 2 p.m., the flames, driven by 35 mph winds, had spread over roughly 500 acres, were threatening an estimated 1,000 homes and had sent a thick pall of brown smoke to the southwest above the North County and out over the ocean, according to Cal Fire. As of early evening, crews had gained no containment on the fire, which had grown to about 4,100 acres while being pushed by stiff Santa Ana winds "at a dangerous rate of spread," Cal Fire reported. At least 20 structures were destroyed and 12 damaged, according to Cal Fire Capt. Nick Schuler. "This fire could make all the way through Oceanside to the coast if it continues," he said. Around 23,000 residents from about 5,000 homes were under evacuation orders, according to San Diego County officials. The major fires are Lilac fire (San Diego County) Size: 4,100 acres Containment: 0%. Liberty fire (Riverside County) Size: 300 acres Containment: 5%. Thomas fire (Ventura County) Size: 115,000 acres Containment: 5%. Creek fire (Sylmar) Size: 15,323 acres Containment: 20%. Skirball fire (Bel-Air) Size: 475 acres Containment: 30%. Rye fire (Santa Clarita) Size: 7,000 acres Containment: 25%. 2017 has become the year of the wildfire, with record-breaking fires around the world in Chile, New Zealand the U.S. and Europe with many of the disasters blamed on arsonists leaving the Portugal government to claim they were started by terrorists! "New Delhi has become a gas chamber," with levels of PM2.5 that enters deep into the lungs and bloodstream, reached 703 double the mark of 300 that authorities deem as hazardous from fires caused by farmers burning off dead vegetation. these fires are being set by DEWS (diredcted energy weapons) research DEW'S. look at pictures of past fires. not normal fires, impossible to be just by looking at the after pictures.